Auto fill textarea from drop down selection? 1) User selects an option from a drop down item. 2) Depending on the option chosen, text will be auto-filled in a textarea. Is this, or something similar to this, possible? Hello Jono, thanks for posting your inquiries here. Yes it is possible by creating conditions. Consider this setup, 1 dropdown box with 2 text areas - each has their own default value. To set a default value, click the text area, click Properties: Text Area Name and click Default Value as shown in the illustration below. After you have done that, click Setup & Embed and click Conditions. In this case, we are going to use "Show/Hide a Form Field" option. Click Next to proceed. In the next window, you can define the condition and the action. 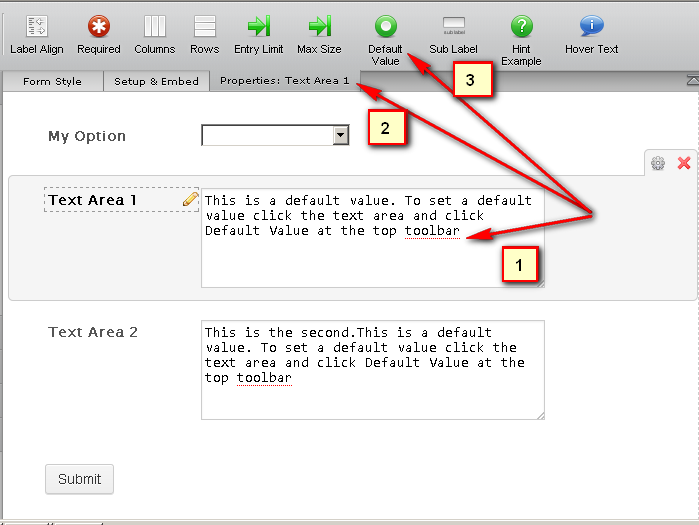 In this example, I set "My Option" which is my dropdown or combo box and set the condition if it equals to value "Show TextArea1". If the above rule is met, then the action will "Show" the "Text Area 1" Box. I did the same for Text Area 2. You can check my demo form here. 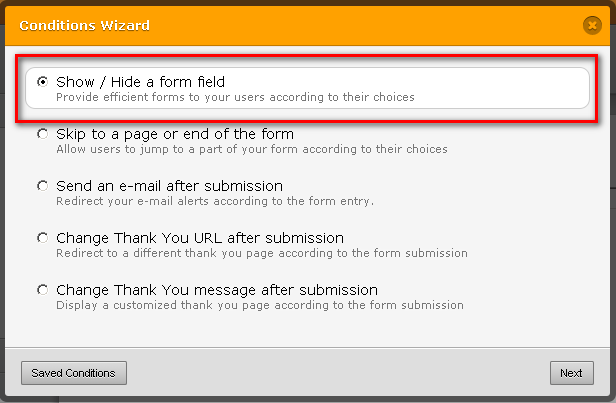 You may clone the form using the form URL and customize it if you want. I hope this information is useful to you. If you have further questions or concerns please post them here on the forum. ardy0689, thank you for this very detailed answer. I am familiar with JotForm conditions, so this makes sense to me. I have to say, this level of support is fantastic! Thank you very much. I will be suggesting you guys to someone. If you could use any testimonials, I'd be happy to write you one. We appreciate very much to know that you are a raving fan of us!.